Police and government spokespeople in the wake of Thailand's string of bombings singled out nongovernmental organisations (NGOs) in particular, pointing out their failure to make any statements condemning the violence. Specifically, they were likely referring to foreign-funded organisations posing as NGOs, who have systematically attempted to divide public opinion, undermine the stability of the nation and the government as well as for years, transparently calling for lopsided protection for opposition groups, but not the victims of the opposition's systematic violence. Foreign media organisations would pick up on this, attempting to portray the statements as inappropriate. But a look at foreign-funded organisations posing as NGOs before and after the bombing shows not only their failure to condemn the deadly attacks, but a agenda that meshes directly with the intentions of the bombers. Prachatai, occupying an office just off of Ratchada Soi 14, is funded several million baht a year directly from the US State Department through its National Endowment for Democracy and USAID organisations. It also receives significant funding from various European government agencies, as well as Open Society, founded and directed by convicted financial criminal George Soros. Prachatai has attempted to hide this funding from its readers for years. In 2011, independent media attempted to pressure Prachatai to disclose its funding after employees and supporters attempted to portray the organisation as entirely funded by donations. In August 2011, when they did finally disclose years of foreign-funding, it would be their only such disclosure, made only in English with their Thai readers to this day still unaware of who funds them or why. 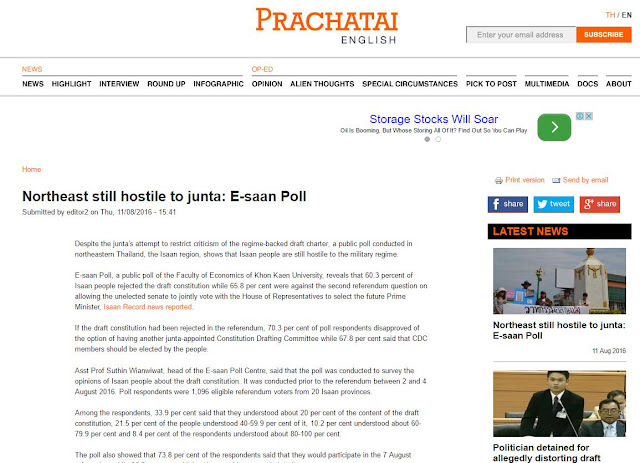 Despite the junta’s attempt to restrict criticism of the regime-backed draft charter, a public poll conducted in northeastern Thailand, the Isaan region, shows that Isaan people are still hostile to the military regime. 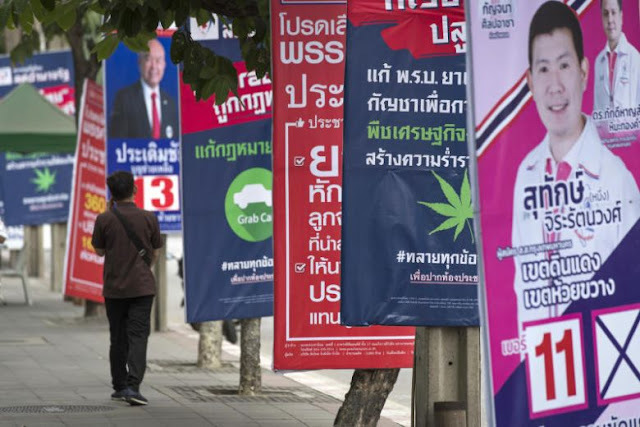 It was just the latest in a series of articles the foreign-funded media platform published in the wake of the August 7 referendum in which Thais overwhelmingly voted "yes" on a new national charter that all but eliminated the possibility of opposition parties Prachatai and its foreign sponsors support from illegally taking and consolidating power as they have in the past. Clearly, Prachatai's goal, despite the incontrovertible results of the referendum, was to portray Thais as being "hostile" toward the Thai government. This is precisely what the bombers who carried out multiple deadly bombings across the country on August 11-12 sought to do as well. As of August 13, 2016, there is still no condemnation for the bombings anywhere on Prachatai's English site. It should be noted, that when and if an opposition member affiliated with or supported by US-funded Prachatai is detained or a staged event is disrupted by government security forces, Prachatai publishes numerous articles within a single day. It is difficult to believe that a multi-million baht media operation with dozens of staff and associates is unable to muster even a single paragraph to condemn an act of hostility toward the nation. In reality, Prachatai, like those posing as journalists in the media and impersonating professors across academia, appear to tacitly approve the violence with some supporters of the opposition going as far as equating the murder of innocent bystanders to "resistance." Those who make peaceful revolution impossible will make violent revolution inevitable. John F Kennedy. Clearly linking the deadly terrorist attacks which killed and maimed innocent bystanders to "resistance" associated with Thailand's foreign-backed opposition, the comment received overwhelming support from within the skewed pro-opposition forum. While the supporters of ousted former-Prime Minister Thaksin Shinawatra, his political party and supporting organisations including the foreign media publicly denounce those linking them to the bombing, it is clear that they are eager to return to the violence they have regularly sown throughout the country for over a decade. Foreign-funded organisations like Prachatai not only appear to be aiding and abetting terrorism by attempting to prepare a rhetorical defence for "hostility" and violence, the fact that they are posing as a "nongovernmental organisations" when they are in fact funded and acting on behalf of foreign governments damages the work of real NGOs in Thailand. 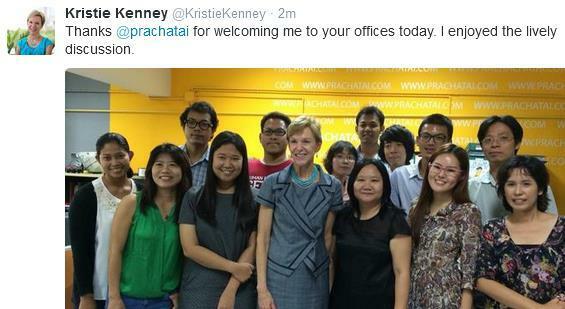 Prachatai is but one of many US-European funded organisations engaged in this behaviour, actively concealing their foreign funding, providing lopsided protection for an opposition who itself seeks to usurp the human rights and freedoms of others and who have once again demonstrated their indifference toward standing up for the principles they claim to uphold. Thailand desperately needs to reform its NGOs laws to protect legitimate organisations serving the community, separating them from those only pretending to be.